Driver based forecasting is the linking of operational activities to the calculation of key variable revenues and expenses. Rather than focusing on budgeting or forecasting the end dollar amounts, consider how they are calculated. The calculation components are the key assumptions and your operational drivers. Drivers are the key activities that go on within your organisation. If there was no activity then no resources would be consumed and therefore no budget would be required. What drivers should I use? How do I make drivers easy for our managers and/or clients to update? How do I incorporate drivers in my rolling forecast process? First consider your organisations key variable revenues and direct expenses. Make a list of the variables used to calculate these revenue and expenses. Create folders to group related items. 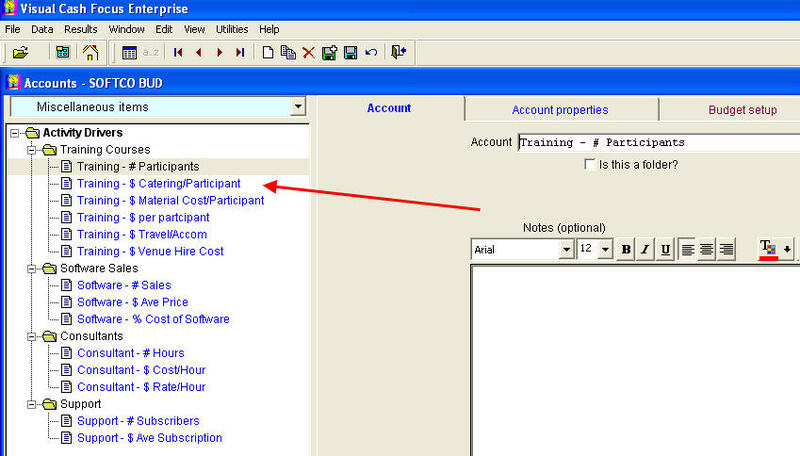 Go to your variable Revenue and Expense lines and use equations to link them to the drivers. Note the list of drivers for delivering training courses. Revenues are calculated by multiplying the # Participants by the $ per Participant, where as the cost of training courses is calculated by multiplying the number of participants by the catering and material costs plus the venue hire and travel costs. Note how the account descriptions are similar to the folder name. A simple naming convention will help later on when selecting the specific driver combinations in the revenue and expense calculations. Also note that drivers can also include Capital Expenditure and other balance sheet items that have a cash flow effect but do not have an immediate profit impact. The overall objective is to translate what your organisation does i.e. your “operational” activities into financial terms and to make it easy to engage other managers in the forecasting process by making the task revelant to what they do. Drivers add integrity and context to the results by explaining how your organisation works and by enabling others to recalculate key revenue and expenses results from the driver list. Drivers should be a meaningful alternative to entering or calculating revenue and expense predictions. Start with a suggested list and then aim to refine them over time so that they become more relevant and accurate. Some Drivers may need to be gathered or calculated via linked templates. E.g. Cumulative Patrons – these are based on opening +/- a churn factor to give closing or cumulative patrons. As the model is rolled for each reporting period, an actual plus forecast driver trend is a very powerful measure. Do not include fixed costs in the driver set unless they are significant events and are likely to change due to say restructuring. An exception is Payroll – If payroll is significant it will have its own link to an external calculation. This enables phasing, resource allocations and keeping highly sensitive data out of the model. Fixed Costs are usually managed by exception since by nature they are usually much the same one period to the next.